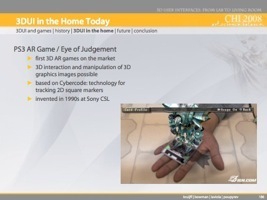 The links below will allow you to download electronic (PDF) versions of the course notes received by attendees at a short course on 3D user interfaces at the ACM CHI 2008 conference. Each file contains lecture slides along with additional notes. If you are a teacher and would like to obtain the PowerPoint files used to create these notes for use in your class, please write to us [3dui(at)3dui(dot)org] with your name, the name of your institution, and your intended use of the slides. If you want to learn more about any of the topics in these course notes, take a look at our book: 3D User Interfaces: Theory and Practice. All content in the links below is copyright: (c) 2008 Doug Bowman, Ernst Kruijff, Joseph LaViola, Ivan Poupyrev.